Author(s): Andrea Carotti, Maura Marinozzi, Chiara Custodi, Bruno Cerra, Roberto Pellicciari, Antimo Gioiello, Antonio Macchiarulo. Dipartimento di Scienze Farmaceutiche, Via del Liceo 1 06123 Perugia, Italy. The modulation of FXR receptor remains an attractive area in drug discovery to develop novel therapeutic opportunities for liver and metabolic disorders. Despite the large variety of FXR ligands reported so far, only a very restricted number of agonists have entered in clinical settings. In this review article we provide the reader with an overview on the different classes of natural and synthetic ligands that have been developed by academic groups and pharmaceutical companies to target FXR. We discuss their structure-activity relationships, analyzing the binding modes that some of these compounds adopt to interact with the receptor. Keywords: Bile acid homeostasis, Farnesoid X receptor, Natural ligands, Nuclear receptors, Synthetic ligands. Affiliation:Dipartimento di Scienze Farmaceutiche, Via del Liceo 1 06123 Perugia, Italy. Keywords:Bile acid homeostasis, Farnesoid X receptor, Natural ligands, Nuclear receptors, Synthetic ligands. Abstract:The modulation of FXR receptor remains an attractive area in drug discovery to develop novel therapeutic opportunities for liver and metabolic disorders. Despite the large variety of FXR ligands reported so far, only a very restricted number of agonists have entered in clinical settings. In this review article we provide the reader with an overview on the different classes of natural and synthetic ligands that have been developed by academic groups and pharmaceutical companies to target FXR. 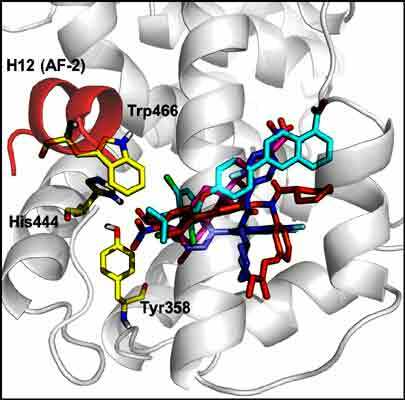 We discuss their structure-activity relationships, analyzing the binding modes that some of these compounds adopt to interact with the receptor.